St James is used just for special services. The present church was built in 1862-3 and is the work of the prolific Victorian architect Samuel Sanders Teulon. It was a gift to the parish by its then incumbent Daniel Capper. 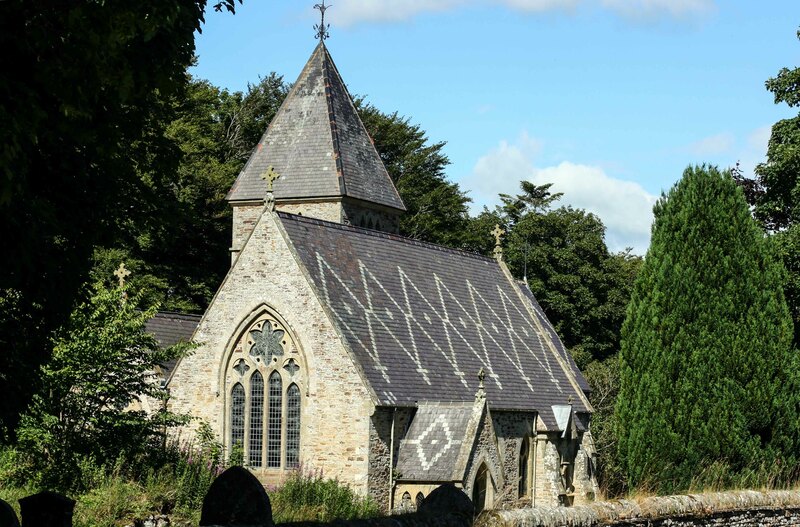 Toulon also built the vicarage, school and other buildings in the village, which because of lead mining, had a population of around 800 when the church was built. It replaced a church rebuilt in 1781 on the site of a medieval building. The foundations of what is interpreted as a pele tower, thought to be sixteenth century, a scheduled historic monument, can be seen in the churchyard to the west of the present building. The building has a broad north aisle, an apsidal chancel and a rather squat tower in the north-east corner. It includes fine glass by Kempe, Lavers and Barraud and some very high quality iron-work. The hand-blown organ is by Gray and Davison is said to have been shown in the Great Exhibition of 1851. The church has been very little altered since it was built, although extensive roofing work was carried out a few years ago. Parish church; 1862-3 rebuilding, by S.S. Teulon for Rev. Daniel Capper of Newbiggin, of 1781 church on medieval site. Snecked sandstone of varied colours and pale ashlar plinth, quoins and dressings; diaper-patterned roof of purple and green slates with roll-moulded ridge-tiles and stone gable copings. Nave with north aisle, north-west tower and stair turret and south porch; apsed chancel with north vestry. 6-bay nave has porch in first bay; buttressed fifth bay projects slightly; buttressed narrow sixth bay. Lower chancel with 5 windows. Steeply-gabled porch has double boarded doors in double-chamfered 2-centred arch; side buttresses and curved kneelers under gable with stone cross finial. 3 small lancets in return walls of porch. Plate tracery in 4-light nave and 3-light aisle west windows; and in other windows, of 2 lights except for group of 3 in fifth and 2 in sixth nave bays, the fifth with central gabled canopy. Roundels in west bays of chancel. Tower has one high stage, with 3-light north window, and lancet slits in second stage, under string and 3 cusped belfry openings. Round stair turret with conical roof, on north-east corner. Pyramidal tower roof with peacock wind-vane; steeply-pitched nave roof with finials, and angelus cross; slightly lower chancel roof rounded over apse. Interior: painted plaster with ashlar dressings. Arch-braced collar-truss nave roof, with upper king posts, struts and 2 levels of purlins with wind braces. Closely-set scissor trusses in chancel. 3-bay north arcade, tower, chancel and sanctuary arches all 2-centred and chamfered; round piers. Chancel has north arcaded frieze; south arched recess for priest’s chair. Stone pulpit and side steps under paired arches, in rudimentary transept. Round stone pedestal font on octagonal plinth continuous with west shaft of arcade. Glass mostly original clear and coloured geometrical; 2 windows commemorating Edward and John Joicey, died 1879 and 1881, by Kempe; chancel windows have geometrical patterns with pictorial panels. Gothic painted-and-carved chamber organ by Gray and Davison, Euston Road, London, said to have been shown in 1851. Exhibition at Crystal Palace. Other original fittings include doors with high- quality iron work, wood altar (now brought forward) and communion rail. Carved alabaster panel on west wall in low relief ‘We thank thee/LORD/for bringing back/our soldiers/safely home/1914-1918.